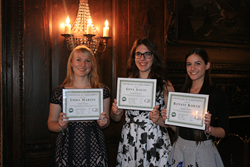 The law firm of Goldstein and Bashner and The Long Island Coalition Against Bullying (LICAB) announced the winners of the First Annual “Anti-Bullying” essay scholarship on May 16, 2016 that was open to all Long Island High School Students. The Long Island anti-bullying scholarship encourages young people to not only stand up for each other but to consider their personal role in creating a bully-free environment. "As a long Island student, how have you helped prevent or stop bullying? This can be on a broad scale, like volunteering or being part of a club, or how you have helped a specific student who was being bullied." “We have talked to numerous parents on Long Island about things they can do to help their child if they are being bullied. Bullying and cyber-bullying has become a part of many young people's lives affecting 70% of teens,” said Neal Goldstein, Partner of Goldstein and Bashner. “The Long Island anti-bullying scholarship encourages young people to not only stand up for each other but to consider their personal role in creating a bully-free environment.” “These students are on the front lines in the fight against bullying and reading these essay submissions gave us great hope knowing the various ways kids are tackling the issue head on and not accepting it as a reality that should continue” said Joe Salamone, Founder & Executive Director of The Long Island Coalition Against Bullying. Goldstein and Bashner is a Long Island personal injury firm. Partners Neal Goldstein and Robert Bashner have been practicing law for more than 25 years, concentrating on personal injury matters including bullying cases and school incidents, slip and fall injuries, car accidents, and assaults. For more information, as well as numerous informative articles, blogs and free reports, visit http://www.eglaw.com. The Long Island Coalition Against Bullying is a 501(c)(3) not for profit organization dedicated to emphasizing the importance of bully free communities on Long Island through education, increased awareness and therapeutic outlets. The organization seeks to turn the tide against bullying on Long Island by working directly with the community, victims and their families through various outreach, advocacy and personal development programs. For more information, please visit http://www.LICAB.org.